My intentions are good. After all, I have bags and boxes of acrylic yarns that I really need to get rid of. True, I could give them away, but on the other hand, I find acrylic yarns come in handy for my Guild's community service project, Project Linus. Volunteers donate handmade blankets for children in crisis. The stories of the lives these blankets touch are wonderful. 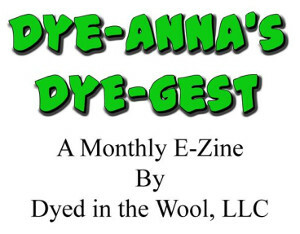 And since one of the requirements is that the blankets must be machine wash and dryable, acrylic yarns fit the bill. In the past I've woven these. In fact the first project off my Glimakra, was a blanket for Project Linus. (Details here.) Last year I dug around in my boxes of finished objects and donated not one, but two more. Currently, because my loom is still unavailable, I thought I would take all the leftover acrylic yarns and knit a blanket. The stash reduction stripe idea came from Janet (Janet's Thread), who routinely uses this technique to reduce her yarn stash. 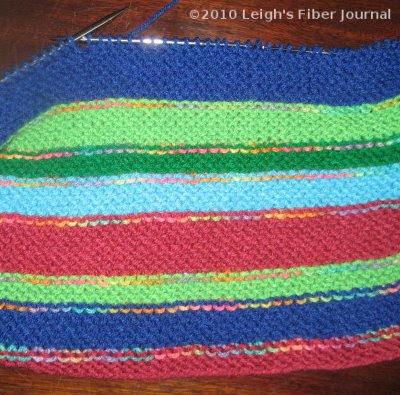 My problem was, that as I chose colorful yarns (a sure kid pleaser) and started knitting, I kept thinking, "It needs turquoise" and "It needs orange." Rather than just using what I already have, I had to run to the store to look for more yarn. Unfortunately (or perhaps fortunately), there wasn't any orange, but I did find turquoise. The result is that I'm having fun with more colors, but I've failed at reducing my stash by much. At this rate, I'll never be finished with my acrylic yarns. Stash Reduction Fail photo and text are © 13 March 2010 by Leigh at Leigh's Fiber Journal. The blanket is beautiful! That's a good idea and a very worthy project. I've worked with kids on quilts for Project Linus. We'll never run out of yarn, will we? I love your blanket, Leigh! Like Sue said: we'll never run out of yarn. The trouble is: where do we find the right yarn when we need it? That's a great way to use leftover yarn, and the blanket looks lovely. I'm sure somone will be a very happy receiver. That is so me! I just learned how to do the two color knitting and have decided that I can use more colorful yarn for the preemie hats. I am destashing and don't have any bright colors. I am dying to go buy some, but I did promise publicly to not buy anymore yarn until the first weekend in May at Maryland Sheep and Wool. I have stuck it out and still have managed to keep my fingers busy. It's tough! I feel your pain! lol! I'm also an admirer of Janet's blankets. This one of yours looks equally bright and cheerful! Stash reduction is a myth. I am still smiling as I type this - what great colors you've assembled and the heart and love that goes with. Eat your heart out Mastercard. This. Is what is priceless. it is used for. I don't have any acrylic yarn and I believe in our church are ladies who knit blankets too. Maybe it is a good thing (at least for me that is) to knit a blanket every now and then. I'll buy some yarn for it today. Thank you for making me realise that the world needs more than just my teatowels and scarves. I did the same thing, I had a ton of donated acrylic and kept making afghans to try to reduce it. After the last one I decided I had enough and donated the stash to a fellow knit club member because she wanted to make some ghans and didn't have much stash, she a baby knitter, but that will change once she feels comfortable with her abilities, it won't take long before she donating on to someone else and the cycle continues. LOL..
Stash reduction - never heard of such a thing. I agree with Marion, that it sounds very mythical and make-believe. Stash reduction - are we supposed to reduce our stash? Really. Hmmmm. I love the idea of using your acrylic up that way...I have a bit of it myself - and I think I'll keep a blanket of some sort on needles for those community projects. I think it is impossible to reduce the yarn stash as there are so many great yarns out there just waiting to be used!